We’re six months into living off-grid in our tiny house on wheels. Woo! When we started this journey we didn’t really know what we were getting ourselves into. We had never set foot in a tiny house on wheels nor did we have any relevant building skills. We also didn’t know how living off-grid would work out. Everything was pretty much a theory in our heads. Now, half a year later, we put the theory into practice and it’s time to share our off-grid living experience with you. Let’s start with the house. Our tiny home is tailor-built to suit our needs. So naturally, it combines everything WE want from a house. Every night we get to sleep in a cozy bedroom loft. We are able to relax in a comfy lounge area in the evenings and we have more than enough storage space for our clothes, hobby items and other things up in our storage loft. Our tiny house kitchen is perfect, fully functioning and it comes with full-sized appliances. I really love looking out of the big kitchen windows while preparing meals. Our bathroom is beautiful, spacious and contains a standard-size shower as well as sufficient shelving space. To us, this house is perfect. It includes all the modern day amenities like internet or A/C and our day to day is pretty standard. But wait, there’s more! Our house is fully off-grid. We’re producing our own electricity, hot water and cooking gas and we’re collecting rainwater for all our water needs. 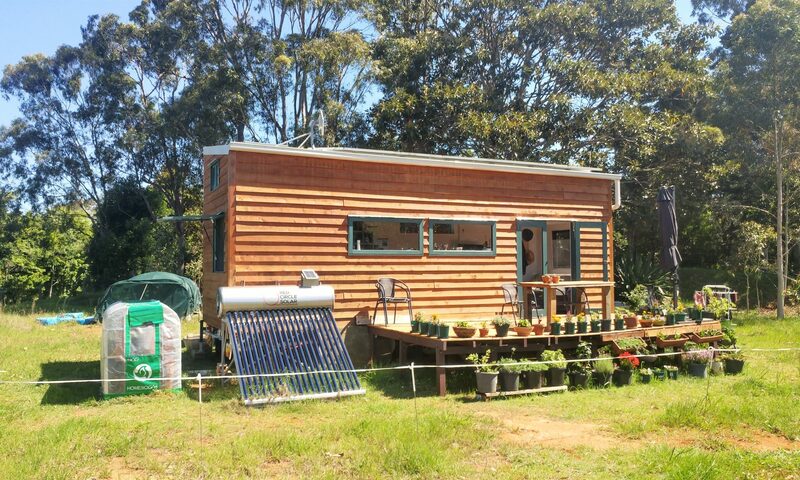 Living off the grid can have its own challenges, so let’s have a closer look at our off-grid setup. We’re very lucky to live where we live. The sun’s shining on most days, temperatures are generally in the late 20’s (degrees Celcius) or higher and even the winter months are sunny. So we’re usually able to generate enough solar energy to run our appliances and everything that needs electricity all year round. To make sure that we survive overcast periods we bought a huge battery bank where we store our solar energy. The batteries keep our tiny ‘illuminated’ for a week. So far our batteries have not let us down. During the summer months, our batteries are fully-charged at around 10am. With the excess solar energy, we are able to run air-conditioning, computers, induction and chargers. We’re only relying on our batteries at night. Our solar hot water unit is ‘powered’ by evacuated tubes which also work on overcast days. So far we never ran out of hot water and we’ve always been able to enjoy a hot shower. Collecting sufficient amounts of rainwater was what worried us the most. We have an abundance of sunshine in our area but sometimes not enough rainfall. Especially winter and spring are challenging seasons because they are traditionally the dry months. While building our tiny we experienced four months of no rainfall which concerned us a lot. Argh! So collecting enough water is definitely a concern. This winter, however, we seem to be lucky because it’s been raining quite a bit which almost filled up our tank again. We really love our biogas digester and are surprised by its performance. During the summer months, the digester produced enough cooking gas to prepare coffee or teas in the morning and warm meals in the evening. The only reason gas would sometimes run low was because we didn’t ‘feed’ the digester enough. However, gas productions slowed down significantly in the winter months. The digester is most productive in temperatures above 25 degrees Celsius but temperatures drop to around 15 degrees Celsius during the day and are even lower at night. As a result, gas production slowed down and we eventually ran out of gas. Now, that’s not a big problem for us because we also installed an induction cooktop in our kitchen. The idea is to use gas in the morning, in the evening and on overcast days but when the sun is out we use induction. So far, this has worked very well for us. To sum it up, we are definitely more aware of our energy consumption and water usage. On overcast days I won’t use the oven or the washing machine and Paul won’t do excessive PC gaming sessions. We are very conscious of our water usage and try not to waste it. But being aware doesn’t equal restricted and we still have our large battery bank in case of electricity shortage. To be honest I’m having difficulties coming up with a cons – list. I’m clearly biased. Sure, sometimes I hit my head on the ceiling in the bedroom loft, we have to climb a ladder in order to get to our hanging clothes and yes, we have to empty our toilet bucket. All these things can be annoying but they don’t outweigh the many benefits. We’re not stuck with a massive mortgage for the next 30 years, we only pay a small rent for the land, we are able to live in and with nature. Our carbon footprint is very little, we utilise clean energy nature delivers to our doorstep every day. We left the city grind behind us and all the stress that comes with it but are still able to live a modern, contemporary lifestyle. This is the lifestyle we chose, it was a conscious decision and it works for us. I’m proud of what we have achieved together. Somehow we managed to build a house that is weatherproof with no relevant building skills, and we’re still together. I LOVE our tiny dwelling, it is truly home and we could not ask for a better, more perfect or cozier home. So you collect rainwater and use that for showering and drinking – I just wonder if you have a special water filter to make the water safe to drink after it’s sat in a water tank for a long time? Also, I recently looked into buying an electric car and it turns out manufacturing the battery produces incredible amounts of CO2, so you have to use the car for a heck of a long time to “undo” that CO2. I wonder if you know of any statistics on your batteries and how long it will take until they become carbon-neutral?